Roehampton 1987 by Christine Thomas. Paint On Ceramic Tiles. There have only been a few examples of painted tile murals in London. This is one of them. It was created in 1987 by artist Christine Thomas with the Wandsworth Art Project. It features ideas submitted by members of the local community who used the Roehampton Family Centre; they also got involved with the painting of the tiles. The piece was opened in later September of 1987 by actress Nerys Hughes. Originally the mural was located on the fascia wall of the Danebury Junior School. 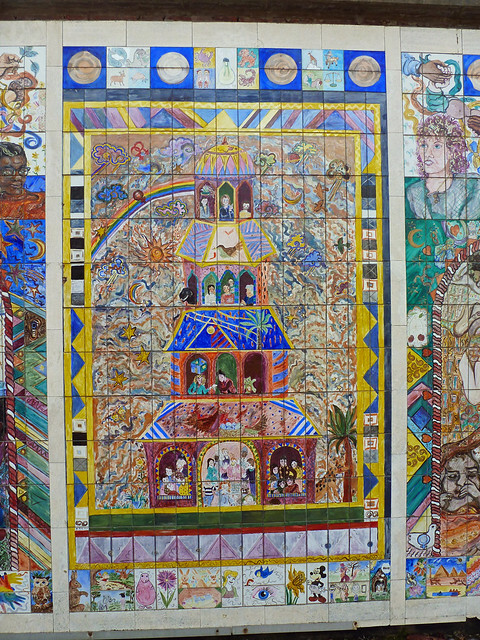 When the school closed in 1996, the local people fought to save the mural. A 128 signature petition was handed to the council asking for preservation of the piece. The campaign assisted by then Roehampton councillor Pauline Brueseke, was a success and the mural is still there today! There is very little evidence of damage to the piece. It could do with some signage to explain it's story. Catch a train to Clapham Junction. Then take the 170 bus to the end of it's route. The final stop is next to where the mural is located. You should see a row of shops; the mural is at the end of these.